Direct Primary Care (DPC) is a new, innovative way to deliver primary care in which there is a direct relationship between the patient and the physician, bypassing third party payers. DPC is concierge-level primary care at an affordable price. DPC works through a monthly membership system, like a gym membership and then… that’s it! How are you able to offer this level of service so cheaply? In a conventional, insurance-based practice, a large proportion of the costs of the overhead is associated with coding, billing, and collecting payments from insurance companies. These processes are extremely complicated and time-intensive requiring teams of administrative personnel to manage it. By completely cutting out the middle man, we are able to save a significant amount of money on overhead and we pass that savings on to our patients. What if I need to be referred to a specialist or have imaging done, such as X-ray or MRI? We are not an insurance company, and you will still need insurance for other medical expenses outside of the scope of primary care. We hope to avoid specialists if possible, but if necessary, we will communicate directly with your specialist in order to best coordinate your care. In terms of imaging, many patients will utilize their insurance as they otherwise would. We recognize that many will choose to use our services with a wrap-around low-premium, high-deductible insurance plan. Therefore, we have negotiated reduced prices for imaging for direct payment to the individual imaging companies. Direct payment has the potential to be cheaper than the out-of-pocket expenses associated with paying through insurance. As with imaging, patients may choose whether they want to have their labs processed through insurance or access our negotiated discount cash pricing system. We assist our patients in this decision by estimating the insurance bill price and how much they may be responsible for and comparing that to the cash price. Why should I pay for primary care when I can get it for free? 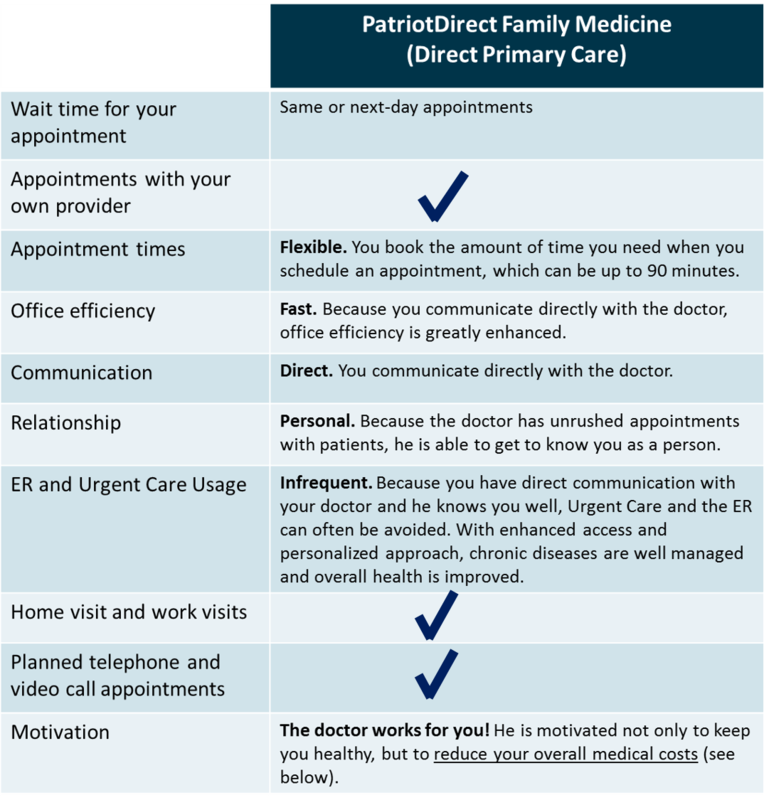 Can Direct Primary Care save me money? Is Direct Primary Care political? We are not Democrats nor Republicans and we are not for or against Obamacare. Direct Primary Care is not about political ideology, it is about freedom. We believe that people should be allowed to spend their money on whatever they choose. For those that value their health and their relationship with their personal physician, DPC offers an affordable alternative. It is the freedom to choose that is the essence of patriotism. What does the American Academy of Family Physicians say about DPC?